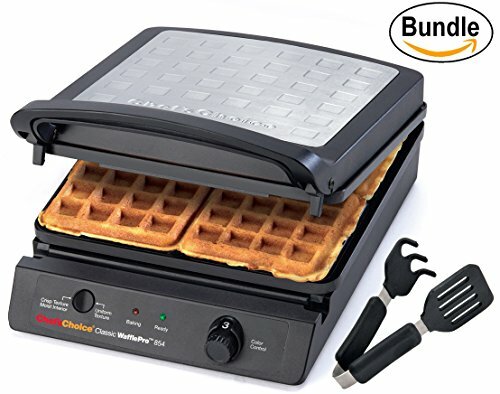 Chef'sChoice® 854 InternationalTM Classic WafflePro® 4-Square Waffle Maker Model 854 & Zonoz ez-Mini Grab and Lift Silicone Tongs (Bundle) - This elegant new waffle maker bakes four delicious waffles in just two minutes or less! Enjoy the fresh taste and delicious aroma of these perfect homemade waffles that will delight the most discerning palates from children to adults. Ideal for homemade or quick mix batters, the Classic Waffle Pro # 854 features a superior non-stick easy release coating and consistent, even heating that guarantees beautiful waffles uniformly cooked inside and out for the perfect tasty treat. It quickly recovers its temperature so it's always ready to bake and feed even the biggest of appetites. The top waffle plate is attached with a floating hinge to ensure uniform thickness and even baking. A convenient, secure latching handle combined with a built-in cord storage compartment allows this waffle maker to be efficiently stored in a space-saving upright position. ------ Zonoz ez-Mini Grab and Lift Silicone Tongs, with the function of a turner and a fork, this ez-Mini Grab and Lift Silicone Tong is an excellent tool for lifting waffles from a hot waffle iron. Silicone prongs fit neatly into pockets to secure waffles without tearing. Eliminate the risk of using metal forks with electric waffle makers. Won't scratch glass, nonstick, ceramic or metal surfaces. Dishwasher-safe. Extremely Fast! Quad® system bakes 4 waffles in under 3 minutes! Advanced Tast/Texture Select® for ultimate taste, texture and aroma. Fast Bake-for crisp outside Slow Bake-for crunchy, uniform texture. Precise temperature control for consistent even baking. "Waffle Ready" beeper. "Baking" and "Ready" to bake LED indicator lights. Superior, non-stick, easy release and easy clean coating. Convenient, latching handle. Built-in cord storage. With the function of a turner and a fork, this is an excellent tool for lifting waffles from a hot waffle iron. Silicone prongs fit neatly into pockets to secure waffles without tearing. Eliminate the risk of using metal forks with electric waffle makers. Won't scratch glass, nonstick, ceramic or metal surfaces. Stay-cool handles with thumb and finger indentations for nonslip control. Also great for use with griddles, panini presses, grills or other specialty type cookware. Dishwasher-safe. If you have any questions about this product by Chef's Choice, contact us by completing and submitting the form below. If you are looking for a specif part number, please include it with your message.